Daylilies are one of the most popular and widely grown perennials. In fact, Hemerocallis is the second most popular perennial in the United States, second only to Hosta. Daylilies form attractive clumps with smooth grass-like foliage. The long, narrow leaves are heavily ribbed and two ranked, forming regular fans. Daylilies are commonly categorized into one of three categories based on foliage type (Dormant, Evergreen, and Semi-evergreen). 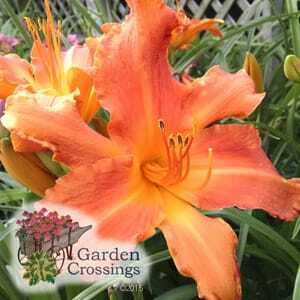 Daylilies within this category are deciduous and completely losing their foliage during the fall and winter months. The new growth (fans) develops from the crown and remains slightly below the soil line until conditions are suitable for growth in the early spring. Cultivars in this category are considered the hardiest and perform well in cold climates. Hemerocallis within this category has foliage present year round. During the winter months, these cultivars continue to grow in mild climates throughout the winter months, grow slightly in transitional climates, and often experience leaf injury in cold climates. Evergreen varieties often do not survive the cold winters in northern parts of the country unless they are well protected with insulating materials such as mulches. In cold climates, the foliage is often slow to green up in the spring and often appears yellowish- green until the temperatures warm up and the plant has returned to full, active growth. Daylilies with semi-evergreen foliage behave like dormant varieties in the North, but like evergreen varieties in southern frost free climates. During mild winters, the foliage often remains evergreen. Semi-evergreen cultivars usually perform equally as well in northern and southern climates. Daylilies produce an abundance of showy, funnel-shaped, lily-like flowers atop slender flower stalks called scapes in early to mid-summer. Through extensive breeding efforts, there is a vast array of flower colors and combination of colors available today. Nearly every color is available including various hues of carmine, lavender, maroon, orange, pink, red, rose, scarlet, and yellow. Hemerocallis cultivars are most commonly marketed by their blooming characteristics. They are commonly categorized into groups by the time of the year they bloom. Early bloomers typically bloom in June, mid-season bloomers flower in July, and late bloomers do not flower until August. Daylilies are also categorized by the length of time they bloom. Repeat bloomers (rebloomers) produce an initial flush of flowers in the late spring or early summer and will have at least one additional flush of bloom later in the growing season. Hemerocallis categorized as extended bloomers produce flowers that remain open at least sixteen or more hours per day. With their reliability and beauty, daylilies have the reputation of being one of the toughest, most adaptable perennials used in the landscape. The genus Hemerocallis translates to "beauty for a day" from the Greek words 'hemero' (one day) and 'callis' (beauty). Both the genus and common names refer to the individual flowers which last about 1 day. Hemerocallis are generally hardy throughout Zones 3 to 10. Evergreen and semi-evergreen varieties are perform best in northern climates and semi-evergreen and evergreen cultivars are most commonly grown in southern locations. Daylilies form attractive clumps of arching, sword-like foliage of various sizes ranging from 12 to 30 inches tall by 12 to 24 inches wide. When blooming, the flower scapes commonly reach 12 to 36 inches tall. Hemerocallis prefers to be planted in landscapes with fertile, moist, well-drained soils. They grow best in locations with full sun to partial shade. Once established, daylilies can withstand heat and drought better then most commonly grown perennials. Conversely they can tolerate sites that occasionally are wet, but do not perform well in consistently water logged soils. Containerized daylilies can be planted throughout the growing season, but are most commonly planted in the spring or the fall. They should be planted even with or just slightly higher then the soil line. Generally considered easy to grow and require little routine maintenance. In fact, once established they need virtually no care. To maintain a clean and attractive appearance, many gardeners remove the flower stalks once the blossoms have faded. Mulching during the summer months will help keep the soil moist. Many gardeners remove withered, dried foliage form the beds in the fall to keep the beds looking nice and to keep the plants disease free. If the clumps become too large, they can be divided every 3 to 4 years. Generally, they can be grown without many insect or disease problems. Aphids, crown rots, leaf spots, leaf streak, rust, and spider mites may occasionally become problematic. Hemerocallis are commonly used as accent or specimen plants, in borders, and as edging plants, groundcovers or mass plantings. One of the biggest attributes is they require virtually little care; in fact, they thrive with little to no attention. Once established, daylilies are drought tolerant and perform well across a wide range of growing conditions. When blooming they attract butterflies and hummingbirds into the garden. These tough plants are also resistant to deer and rabbit feeding. Daylilies blend well with other sun loving perennials including Agastache, Coreopsis, Echinacea, Gaillardia, ornamental grasses, Nepeta, Penstemon, Perovskia, Salvia, and Sedum. With an almost infinite number of forms, sizes, and flower colors Hemerocallis also looks great alongside other daylily cultivars.